GPS "tracks" in G7toWin (.g7t) format for all 57 trails in Sandia Mountain Hiking Guide can be downloaded by clicking on the trail names in the Table, below. When you have downloaded a trail track, you should be able to upload it to your GPS receiver (GPSr) using the G7towin program. 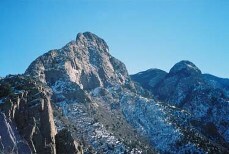 Then, for example, when you hike that trail in the Sandias you can use the track to guide your way. The entire set of trails can also be downloaded at once to your computer in a compressed zip format (763 KB file size) by clicking here.